Congratulations to our hamper winners and thanks to all those you sold the raffle lines. Congratulations to our hamper winners as seen below. Aaron Daly won first prize and his ticket was sold by Ryan Curwin. Padric Stafford won 2nd prize and his ticket was sold by Conor Murray. Ms Fitzpatrick won 3rd prize and Casey Moynihan won the sellers prize. Following the AGM of the Parents Association the committee made a donation of €10,000.00 to our school. Pictured presenting the cheque to Mr. Mc Cartin are members of the PA Committee. The donation will be used to update the computers in our computer room which will benefit all our pupils. This donation is possible because of the support all our parents give the PA with their fundraising efforts. Everyone in St. Clare’s N.S. are really appreciative of the support! The parents association is the structure through which the parents in a school can work together for the best possible education for their children. “A parents association shall promote the interests of the students in a school in co-operation with the board, principal, teachers and students”. Usually the parents association will elect a committee who manage the responsibilities of the parent association on behalf of all the parents. The size and formation of the committee is usually determined by the size of the school and the amount of activities to be undertaken. Breakfast Club – SCNS sough €25,000 to fund this scheme in 2017. Tennis Coach & Gymnastics to commence in Jan 2018. Currently the Parents Association Committee is in the process of preparing the school calendars and Christmas Hampers for 2017. The winners to be posted on the web site in the New Year. Easter Raffle Cards are being sent home with your child this week. All cards must be returned to school by March 31, 2017. Draw will take place on April 6th, 2017. All proceeds are returned to the school and directly support your child. 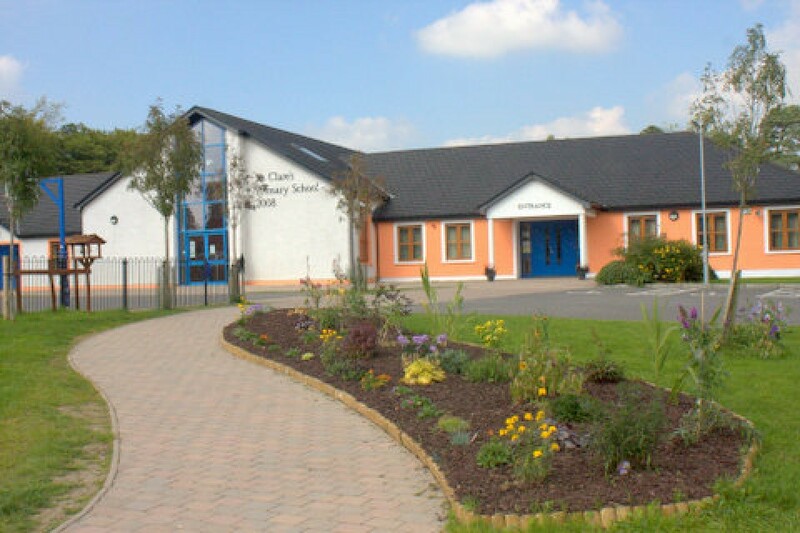 Thank you for your continued support of St. Clares NS. Many thanks to everyone who supported our recent fundraising and a big well done to the pupils in the school pictured here who sold a full card of sponsorship lines! Thanks again to our Parent’s Association who organised the entire event. St Clare’s National School held the Annual General Meeting on the 18th October 2016. At the AGM the Committee presented a defibrillator to the school on behalf of the parents association. Training on the defibrillator to follow. Currently the Parents Association Committee is in the process of preparing the school calendars and Christmas Hampers for 2016. The winners to be posted in the New Year. The Parent’s Association are not running the couch to 5km this year and anybody looking to renew their insurance for the running track in the field, which may have lapsed, are asked to please contact any committee member of Castlerahan GFC. We welcome the new members of our Parent’s Association who were elected recently. The Parents’ Association would like to welcome everyone back after the summer break, with a special welcome to all our new pupils and parents. We hope this year will be enjoyable for everyone. During the year the Parents’ Association organises events to raise funds for the school and promote good relations between teachers, pupils and parents. Last year we came up with some good new ideas and hope families enjoyed our efforts. In June we helped out with the 6th class Graduation serving tea, coffee and cakes. This year like last our first fundraising event will be selling the blotto for four weeks from Tuesday, 15th September. Please give your support and help out where you can. This year’s A.G.M. will be held in the school on Wednesday, 21st October at 8.00 pm. We hope to see lots of new faces with great new ideas. So please come along. Thanking everyone for all the support last year. From the Outgoing Committee of 2015.